Do you snore or wake up in the middle of the night choking and gasping for air? Are you tired, forgetful, or irritable during the day? Do you fall asleep at odd times, like during movies or while working at your computer? You may suffer from sleep apnea, a condition that also increases your risk for heart attack and premature death. 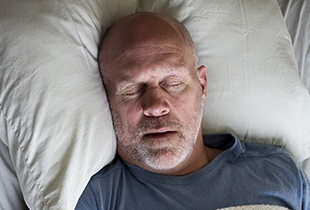 Snoring occurs when the soft tissues in the mouth or throat vibrate as air is inhaled and exhaled. With obstructive sleep apnea, these soft tissues completely block airflow, forcing the body to wake (fully or partially) to resume breathing. This cycle can happen hundreds of times a night, which means the patient does not achieve deep REM sleep, which is necessary for mental and physical wellbeing. Many people turn to a CPAP (continuous positive airway pressure) machine for sleep apnea treatment. With a CPAP, the patient wears a facemask while sleeping, and air is consistently projected into the body. This keeps soft tissues from collapsing and blocking airflow. However, a CPAP is bulky and can feel uncomfortable. In fact, 55% of patients are intolerant to CPAP. Dr. Canzoneri offers a conservative and comfortable alternative called a nightguard or sleepguard. Made from acrylic and custom-fitted for your mouth, the nightguard will keep your lower jaw positioned so that soft tissues will not block your air passage while you sleep. Many patients find relief from snoring and sleep apnea with a custom nightguard by Dr. Canzoneri.